"The Securities and Exchange Commission today announced insider trading charges against a Westport, Conn.-based business consultant who has served on the boards of directors at Goldman Sachs and Procter & Gamble for illegally tipping Galleon Management founder and hedge fund manager Raj Rajaratnam with inside information about the quarterly earnings at both firms as well as an impending $5 billion investment by Berkshire Hathaway in Goldman. 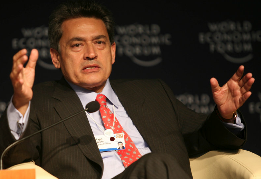 "The SEC’s Division of Enforcement alleges that Rajat K. Gupta, a friend and business associate of Rajaratnam, provided him with confidential information learned during board calls and in other aspects of his duties on the Goldman and P&G boards. Rajaratnam used the inside information to trade on behalf of some of Galleon’s hedge funds, or shared the information with others at his firm who then traded on it ahead of public announcements by the firms. The insider trading by Rajaratnam and others generated more than $18 million in illicit profits and loss avoidance. Gupta was at the time a direct or indirect investor in at least some of these Galleon hedge funds, and had other potentially lucrative business interests with Rajaratnam." Let the PR games at Goldman begin (yet again)!